This post is sponsored by the band Simple Tenants. Did you know that the quote "Music soothes the savage beast" is not correct? It is a misquoted line from a 1697 play called The Mourning Bride by William Congreve. The line is actually "Music has charms to soothe a savage breast." Now you're smarter. Whatever way you say it, it's true - music is magical. It can excite and calm, inspire and soothe. It can whip crowds into a frenzy or it can lull a tired child to sleep. I personally love just about all kinds of music depending on my mood. Fun pop music gets me through a grueling workout, rap music brings out my bad self, classical calms me, jazz makes me feel sophisticated, and Christian music grounds me. Artists use their music just as bloggers use their words - to express their creativity, to entertain, to share ideas, to work through their angst, and even to celebrate and pray. It's pretty amazing what an impact both words and music together have on people's emotions. 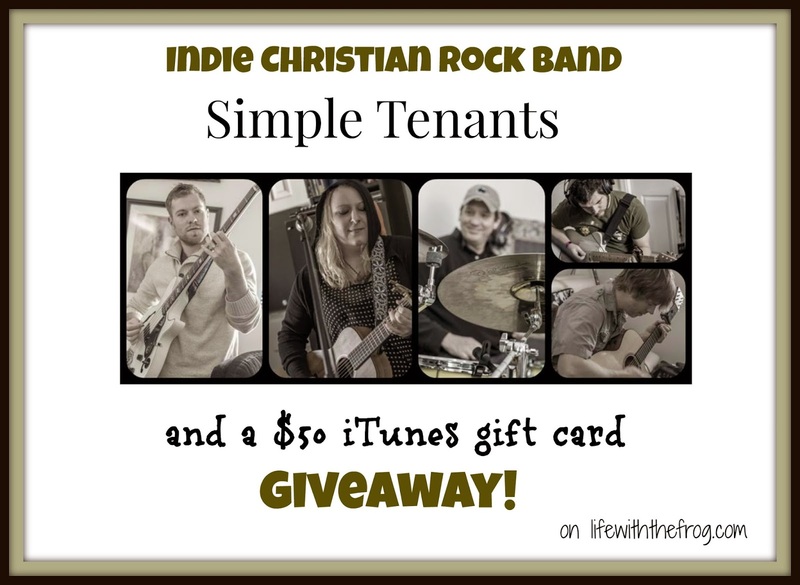 In honor of their first single, Here to Worship, being released on iTunes this week, the brand new indie Christian rock band Simple Tenants is sponsoring a giveaway on several blogs. One lucky reader will receive a $50 iTunes gift card. No strings attached. You do not even have to use it to download their music. You can use it to download whatever kind of songs or apps float your boat. But Simple Tenants would love to have you check out their first single, so they are offering it to all of you for FREE. Anyone who signs up for the Simple Tenants newsletter using their Facebook entry form will receive a free mp3 download via email. Just pop over and and make sure to like their Facebook page while you are there. For your chance to be entered to win the $50 iTunes gift card, fill out the form below. One winner will be chosen at random. Should the winner not respond within 48 hours of being notified, another winner will be chosen. Simple Tenants are responsible for prize shipment. This giveaway is open to U.S. residents only. This giveaway is sponsored by Simple Tenants. All opinions are my own. Visit Kathy's profile on Pinterest. Copyright 2011-2017. All content created and owned by Kathy Glow. Stealing is not nice. Play nice. Powered by Blogger.